What's Font Awesome and who uses it? Font Awesome is an easily styleable, friendly, cohesive set of scalable vector icons for the web. Web designers, developers, or anyone running a website can use Font Awesome. How was Font Awesome born? I was searching for a set of icons to use on my website. While there were a few decent sets out there, I didn't like any of their camera icons. As an amateur photographer, I've always loved the Leica look, so I wanted to make an icon that evoked a similar feel. While working on this one icon, I decided to make a whole set. An icon font seemed the ideal way to go, as they scale infinitely with CSS. The camera icon is probably still my favorite. Also, for the previous several months I'd been using Twitter Bootstrap and loved every single thing about it. Well, except for the PNG sprites. They came in only two colors, and I wasn't crazy about the design. So I decided to make a drop in replacement for Boostrap's icons. And since other icon fonts didn't seem to always play well with screen readers, I wanted to solve that too. It's brave to name your project 'awesome', isn't it? but without a dorky name. Lisa: So what did you call it? One night I was walking home during one of Boston's cold winters and decided to take a detour through Harvard Yard. Some enterprising students had built a cardboard box fort, and conveniently called it Fort Awesome. From that point on, every house I lived in was called Fort Awesome. And in every location this photo was hung. 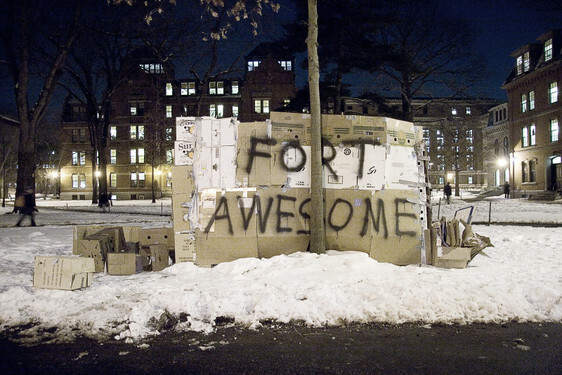 There was Fort Awesome Sommerville, Fort Awesome Cambridge, even a Fort Awesome Beijing where some friends lived. So it became a de facto name of my residence. You'll notice the organization on the Font Awesome GitHub project is in fact called Fort Awesome. That's where the name comes from with just a single letter variation: Font Awesome. What's the key to Font Awesome's awesomeness? While creating Font Awesome, I tried to focus on balancing easy of use and pixel perfection. It seems like folks have found that combination useful. Currently, it's on over 700,000 websites and still growing. Honestly, I am blown away by Font Awesome's success. But I know it's not perfect yet. There's still more to do. Why is the font free of charge? Personally, I benefit from open source every day in my life. So making Font Awesome open source was an easy decision for me. ...by using BootstrapCDN by the venerable MaxCDN. What's the last interesting thing you've stumbled upon the Internet? Yesterday I started using Zero Clipboard for the first time. It's a library that provides an easy way to copy text to the clipboard. You’ll see more of it soon in the Font Awesome documentation. Awesome, isn't it? Share it if you love it! Keep an eye on Dave's upcoming projects. Follow him on Twitter.